Familia Adelante is an evidence-based, best practice, prevention program designed to help at-risk Latino youth, between the ages of 10 and 14, by engaging the entire family. The at-risk youth are academically challenged and on the verge of dropping out. 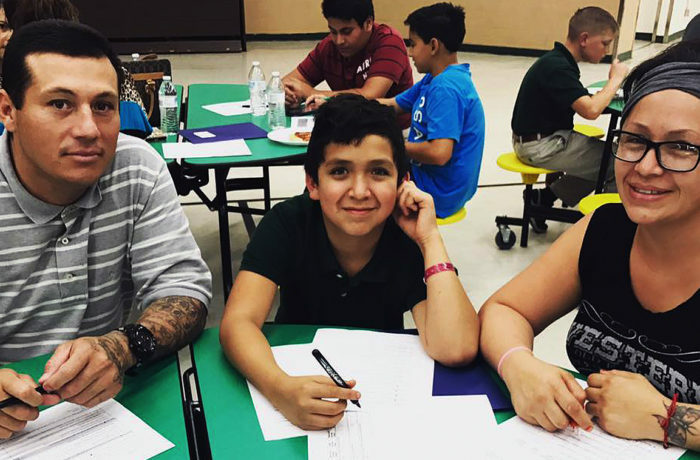 This program focuses on serving the Latino community living on the Southside of Tucson with youth attending Apollo Middle School in the Sunnyside Unified School District. Program activities facilitate improved communication, stress management, substance abuse, HIV/AIDS, suicide and bullying education, and improved study skills for youth. Youth and families meet once a week for two hours, for a total of twelve weeks. Families have conversations about their day, school, and share meals to assure the family is spending quality time together and open up to one another. Parents and youth are separated and both groups are presented with information following a curriculum. Each session consists of a different topic such as HIV/AIDS and substance abuse prevention, communication improvement among families, and stress management. After independent instruction, families come together and work on a HIV/AIDS or substance abuse prevention activity.